Set of Barnett clutch springs for 1996 through early 2011 klr650 . Set of 5. Different wind, different wire. These work very well. Important - they will NOT measure the same length as the factory springs. OEM Kawasaki clutch friction plates. Fit mid-1996 to early 2011. Set of 8. Fork brace fits all KLR650 2008 and later with stock forks. Drilled and tapped for lower fender. Cam chain tensioner gasket, OEM Kawasaki part. Often needed during valve adjustment or other top end work. Kawasaki OEM clutch cover gasket. Low fender mounting kit for use wit the Eagle fork brace. Replaces the factory cast part with a much stronger machined bracket. Make your life easier when working on the carb - get these screws! Repplcement fuel inlet elbow for carb with o-rings. This is genuine Kawasaki part. This fits carb's 1987-2009. In 2010 Kawaski changed the carb. This links slightly change the rear suspension geometry - they are very popular! The bike will sit slightly higher in the back. It will also take more weight to compress the suspension as compared to the stock setup. Shim kit to remove the lateral play in the countershaft sprocket. replacement screws for the front master cylinder reservoir lid. Steel, comes with 4 crush washers. Manual Petcock, replaces factory vacuum petcock. Direct bolt on. Machined aluminum oil filler cap. Uses 6mm hex key (there's one in the factory tool kit). Includes new o-ring too! Hard anodized. Natural hard anodize closely matches engine color 1997 through 2010. Also known as a trail jack. Used to support front or rear of bike in combination with sidestand and either wheel. Light, made from steel tubing, fits in a tank bag or tool tube. Telescopes so can be used for any bike. Cylinder boring and honing for the 692 piston kit. Read full description before ordering. Subframe bolt upgrade Uni air filter Uni air filter care kit. Non-drill though kit. Replace factory bolts with stronger bolts. These work very well in the KLR. Flow tests by Cary Aspy said these are the best. Filter care kit available separately. IMPORTANT! You must have the proper oil. Order the filter care kit if you don't have the proper oil. These are not oiled when new! Keep your engine and filter working well with this kit. Filter cleaner and oil. 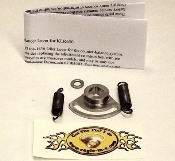 Valve shims for KLR650 Viton valve stem seals for your klr650 engine!